Life passes pretty quick and the day often begins with a fluffy of activity. If you're off to school, office or wherever you end up doing. Skincare routines aren’t something you should skimp on - No matter how pressed for time you are you should never neglect your skin. Here is my quick to 3 minute morning skincare routine and some tips to speeding up your skincare routine - Now you have no excuses. You don’t want to spend ages rummaging around your drawers or bathroom cabinet trying to find that one product. 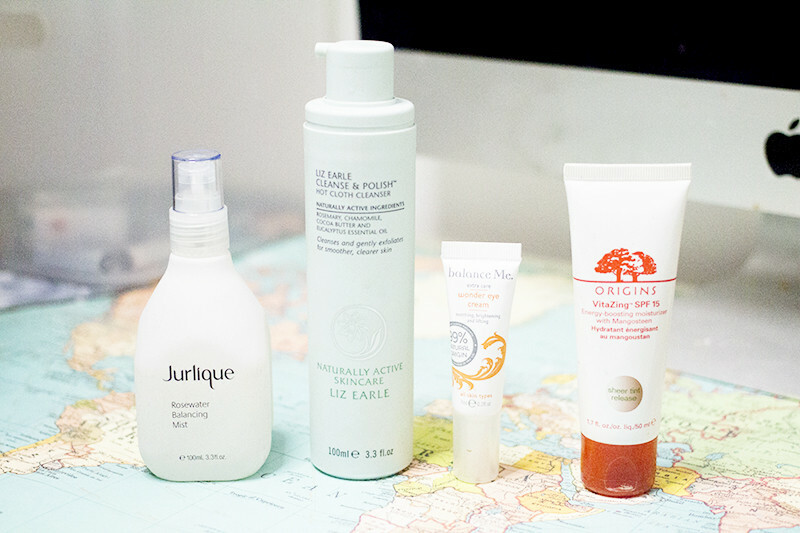 Separate your quick skincare routine from the rest of your items so you can grab it at ease. You could even get a little storage box that you can grab and take into the bathroom with all your essentials - things like shampoo, conditioner and shower products. It gives you the peace of mind that it’s all there and you don’t have to keep searching for odds and ends! Use a gentle but deep cleansing cleanser to refresh your skin. I really like the Liz Earle Cleanse and Polish, it cleanses the face while not stripping the skin of moisture. You could even do this step in the shower and rinse off as you leave. Using the muslin cloth that comes with Cleanse and Polish you're exfoliating and cleasing in one step. Next pat the face dry and pop a spray on toner. I’m really enjoying the Jurlique Rosewater Balancing Mist. It's packed full of natural botanicals it leaves the skin super refreshed ready for the day. The spray bottle cuts down having to rummage for cotton pads to add toner! Pat on a hydrating eye cream like the Balance Me Wonder Eye Cream - This refreshes and soothes the under eye area. It sinks in speedily too which is a bonus for swift skincare routines. Finally to make your face look awake, moisturised and protected in one use the Origins Vitazing SPF 15. This adds colour to the skin, boosts the complexion and provides a light SPF coverage. It's a great multi purpose product which is exactly what you need when trying to cut down skincare routines! I totally agree with your statement that you don’t want to spend ages rummaging around your drawers or bathroom cabinet trying to find that one product. Separate your quick skincare routine from the rest of your items so you can grab it at ease. You could even get a little storage box that you can grab and take into the bathroom with all your essentials things like shampoo, conditioner and shower products. It gives you the peace of mind that it’s all there and you don’t have to keep searching for odds and ends! Thanks for sharing such an informative information.